I lamented for weeks when Yahoo Site Explorer went away but it’s back (sort of)! Before I was even at work, I was on my laptop at home, brushing my teeth and playing in the new shiny UI in Bing Webmaster Central. Although I scanned my way though all the goodies, I quickly went to the Link Explorer – all that link data that I was missing for what feels like so long. I know that I can’t be the only one who was really excited, so I decided to create a short and sweet guide for the brand new Bing Link Explorer. So, let’s start at the top. When you first run your site through the Link Explorer, your first instinct is to quickly scroll down and up to see how much link data is in there. You’ll find that it is very different then other subscription link indexes in that it does not hit you with all the link data at once. Right when you enter in a URL, Bing Link Explorer kindly de-duplicates the links by domain, and probably does a little more editing in addition to that, and shows you about one link per domain, thereby giving you a cleaner picture of your overall backlink profile, so you can actually evaluate, instead of data overload – unless you’re an excel wheeler and dealer of course . From this initial screen, you can use a variety of options further explore your or another sites backlink profile. Let’s explore what some of the knobs and dials do. Scope: This mysterious language simply refers to if you want to look at the backlinks for your specified URL or for the specified domain. 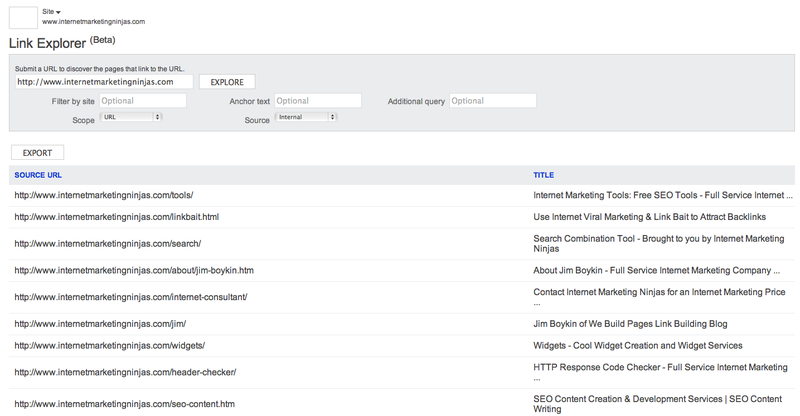 Source: The source option is a simple drop down that allows you to see ‘internal’ , ‘external’ or all backlinks. When you run your first search and the Link Explorer show results, you’ll see a column for ‘SOURCE URL’ and ‘TITLE’. These are sortable and exportable. I think they export to excel, although expected, is awesome and cool of them to include. It frees you up to merge in other data sets, to include the data where Bing falls short using VLOOKUP’s. Filter by site: This feature allows you to filter your backlink data by site. I did several tests to explore this functionality. The sitewide link – I ran a site, on source option ‘external’, and used the filter by site option to explore backlinks from a site that I knew I had a sitewide link from. To do this, I just entered in the homepage url of the site in the filter by site form field. This specific site has 3,830 pages indexed in Bing, all of which are linking to me. When I exported, Bing returned 154 backlinks from that site. Although it’s cool that the export was not complete, I *wish* (hint,hint ) I knew about how many more backlinks I had from the site that Bing was not showing me. The Subdomain – Subdomains can be tricky for a lot of tools, so I decided to investigate how Bing Link Explorer was handling them. To handle subdomains in the Link Explorer, you need to select source as ‘external’ and and filter by the site for the domain you’re trying to evaluate the internal linking between. One weird thing I noticed while I was evaluating this is that if I had the www.or non-www in in the main input field and the subdomain in the filter by site input field, Link Explorer would return no backlinks but when I tried it the other way around, it worked. Let me know in comments if you’re seeing the same thing. Another interesting thing thing is if you’re trying to evaluate internal linking for a site that has multiple subdomains, you’ll need to do some advanced querying using the Additional query form field to remove the extraneous subdomains, using ‘-’. Anchor Text: Exploring anchor text is a common seo practice and is an especially important part of competitive analysis. Bing Link Explorer give you the ability to the ability to search the index directly for anchor text data. You can use source, to explore links with the selected anchor text for internal links, external links, or all links, as discussed above. When you’re actually doing SEO everyday and everything is a priority, nothing makes you rage like a tool that takes forever to load or an export that takes forever, link tools are no exception. A strong commitment to reducing latency is one of the things that made Google great. I really appreciate that Bing made the Link Explorer lightning fast. I think this is by far the fastest Link Explorer I’ve used. It’s free! I don’t know about you, but I absolutely love getting something for nothing – getting a free lunch is awesome. Bing is very nice to be giving awesome link data back to the people, even though the data is somewhat limited. Yahoo’s Site Explorer was definitely a beautiful large index, capturing a lovely level of depth over many, many years of crawling. Although, I have not yet had the opportunity to fully compare data, I’m very interested in seeing how data quality compares between Bing’s data and other data. How many links bing may be able to pick up that others may have missed and vice versa. Weird error – I got this weird error after clicking around in the Link Explorer for about an hour or so. Maybe it’s a weird beta thing? Link Explorer Automatically Redirects Pages Without Telling You the URL You’re Searching Is a Redirect – This is not a huge thing but if you’re doing some causal querying and you are entering a domain that is a non-www. that is actually a canonical issue and start evaluating at that data as if it is www. data by accident. There is nothing in place to alert you in case of those duh! moments. Link Explorer does not alert you when you’ve tried to search a domain that returns a 404 Server Error – Link explorer just shows a blank screen when you’ve entered a typo and a 404 error was returned. If you’re seeing no data and you’re wondering what’s going on, that should be the first thing you check. I really like the Bing Link Explorer as a competitive intelligence tool, especially if you’re a normal webmaster who may be unable or unwilling to pay for a subscription index and site explorer, this gives you a leg up in terms of getting access to quality data to see how you fare beside your competitors in terms quality and quantity of inbound links. If you’re like me, a geek, that looks at links all day, this is another high quality backlink source, which I consider to be a win in itself. One of the things I believe really strongly in is that multiple backlink sources are always better then a single backlink source. At any given time, I’m looking at backlinks from ahrefs, seomoz’s linkscape, magesticseo, and blekko. I’m very excited to get the beautiful aged links from the Yahoo Site Explorer into the mix. Talk about being about to see a complete picture of a site’s backlink profile! Also, I think Bing Link Explorer is good for checking link data on the fly, and it is really quick on mobile, which I think is the first good tool for checking link data on the fly. One area where it may be tougher to use this tool is link building. Since the Link Explorer is a day old, I guess the big thing I’m curious about is what you guys think: what do you guys think that this tool is good or maybe not so good for? I’ve actually been a fan of Bing Webmaster Tools, even before the lovely facelift. I think they are in the process of building a nice feature rich product to help webmasters better succeed online by helping them improve their website and empowering everyone with more information. I think Bing really gets that the way that Google won in the beginning is by serving users and webmasters, and they are trying to do the same. I think that this is a step in that direction. Since the Link Explorer is so new, I’m very curious what you guys think and if you see a place for it in your life? By The Bing Team; This was the first post announcing the update. This was the first article I read announcing the news. This article summarizes the 9 new tools released. While I agree that it’s quick and snappy, especially compared to products by other third parties, I still find it’s missing the ability to do proper link profiles of competitors sites. Hey Tom – I agree ..but does any tool give you the complete picture. To do a serious link analysis, you want as many link sources as you can grab. Every index has a slightly different grab of links, to get the complete picture, you want to look at as much data as possible taken together. I also think to get an idea of your competitors backlinks, you can get a good sampling using the link explorer. This can give you an understanding of competitor backlink strategies in broad strokes. However, if you’re seeking to really drill down in *exactly* what links your competitors are getting, you want to see as much data as possible. I have looked all over the internet and I can’t find the answer. What is the difference between Bing-Inbound Links and Bing-Link Explorer? (Is the only difference is that Link Explorer can be used on any url?) I guess both of them are showing me backlinks to my site, but the links on Inbound are not quite the same as Link Explorer. How come? Also the graph on Inbound links tells me that I have “Count of links-84” and right under it where it says target page and my site url it says “Count of links-23” is different. Which is correct? And how do I read this?